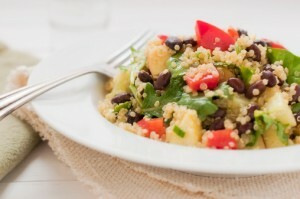 Black Bean & Quinoa Salad - Fig Food Co.
Cook quinoa in water with cumin and oregano until finished. While cooking, combine all other ingredients in a large bowl. After quinoa is done, cool, and add to the bowl. Serve at room temperature. Thanks friend! I’m going to try this tooomrrw for dinner. We are finishing up week one of our vegan, less to no processed foods journey and everyone is feeling better. Thanks for the encouragement. I hope your having a great weekend.